Should a CFO be on Google+? We have all been hearing about Google+. It has been creating a lot of buzz (which is what Google wants) and I am adding to the oodles of social media entries on the subject. The answer is: No. A CFO should not be on Google+ today. There is an exception to my answer. If you are a CFO that has mastered LinkedIn and you blog and tweet, go right ahead into the new world of Google+. If however you do not consider yourself social media savvy, make the best out of the (I can’t believe I’m saying this) old world social media tools. As CFO, you’re a busy person. If you are going to spend time on social media, spend it where the market is mature and defined. Google Plus is so brand new, that you may not know what you are getting yourself into, few people are true experts that can guide you though it even if you wanted help, and you may mess up your reputation by using it ‘wrong’. This is where the conservatism of the finance professional comes into play. Be “old school” and make the best out of the old tools first. My opinion is current as of today. I will let you know when I believe it is time for CFOs to be active on Google+. Also, just for the record, I haven’t bothered with Google+ yet. If you aren’t there yet, why should I be? As we mentioned last week, our CFO Relationship Map shows the need for CFOs to have effective interactions with HR. (For Part 1 of our survey results, please click here). We asked CFOs to rate the responsiveness of HR to their needs. The average scoring is as follows (based on a score of 1 = Needs improvement, 2 = Satisfactory, 3 = Strongly satisfied). Our survey shows that other than for the involvement of HR in the Payroll Process, our CFOs were less then satisfied with all of these areas. Opportunities for improvement for HR: HR needs to be aware that their delivery of services is less than satisfactory in all of the above mentioned areas, other than Payroll. 63% of CFOs surveyed felt that HR needs to improve their responsiveness the Training & Development needs of the CFO and the Company. 59% felt that HR can do a better job with their involvement in the Budget Process. Are you surprised by the results? Do you feel they are different (or the same) in your organization? In all my years working with CFOs, I have noticed that Successful CFOs always play to their strengths and build upon them to help the company they are working for and the people they are working with. Today, I am introducing our new program – The Strong CFO. This program is an ongoing personal development program for CFOs who want to become a stronger and better CFO, delivering value to the companies they work for and the people they work with. This program is only for you if you are committed to your current employer and want to be a better and more effective CFO. If you are a CFO and are considering a career move or are in between positions, I recommend that you work with someone like Cindy Kraft, CFO Coach. Cindy is very strong to help with the specific issues you face. As I mentioned in the title, the first session is FREE, with no further commitment required. This offer is possible because I firmly believe that if you are committed to developing yourself into a Strong CFO, you will continue with my program. Of course, there are conditions. These conditions exist to ensure that you are committed to getting value out the 1st session. What are your strengths? Can you identify them objectively? The Clifton Strengthsfinder Assessment is a tool that I use to help my CFO clients. 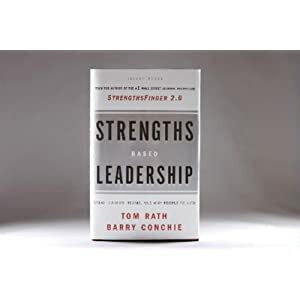 For us to have an effective 1st session, it is important that you read Strengths Based Leadership by Tom Rath and Barry Conchie and complete the online test. – Best times to schedule our first session over the phone. You may be thinking “How can Samuel ask me for my Strengthsfinder results? I would feel open and vulnerable”. I can certainly understand your concern. To alleviate your concern, I will open my kimono – here are the results of MY Strengthfinders Assessment. Now you know a lot about me. Actually, the whole world now has access to my Strengths. I am willing to share my Strengths with the sole purpose of helping you become a Strong CFO. I am willing to make this investment in you. Are you? According to our CFO Relationship Map, Successful CFOs need a strong Finance Team to support them so they can accomplish more for the people they work for (CEO, Board, Investors) and the people they work with (Operations, Sales, IT, HR and others). We created this survey to better understand the areas that CFOs feel they need help with to ensure they have a strong Finance Team supporting them. With this context in mind, please answer our survey. Thank you for your help. We look forward to sharing these results with you. In most companies, the Finance and HR departments are an important support function to the core business. That being said, relationships between Finance and HR can sometimes be strained. Both departments are spending resources that may be seen to not be directly linked to revenue, and they sometimes need to justify their value to the revenue driving departments of the business and the CEO. According to our CFO Relationship Map, CFOs need effective interactions with Human Resources to deliver and enhance their value. We recently completed a Survey which asked CFOs about their interactions with HR. Our survey results will be released over the next few weeks. Half of these CFOs only get Functional day to day tasks from HR. Opportunity for HR: Your CFO wants Strategic Long Term Value. There is a good chance that if you can prove the value of strategic initiatives to them, they will pay for it. Opportunity for CFOs: Challenge your HR leaders. ½ of you are not getting what you want. As CFO, are you getting what you need from HR? If not, why not? Successful CFOs are not the best technicians – they keep (most of) the people they work with happy (most of the time). How do CFOs become Successful CFOs? First, they need to identify and clearly understand the relationships they have. Then they need to have a plan of action to properly manage these relationships. In this blog you will notice our CFO Relationship Map. 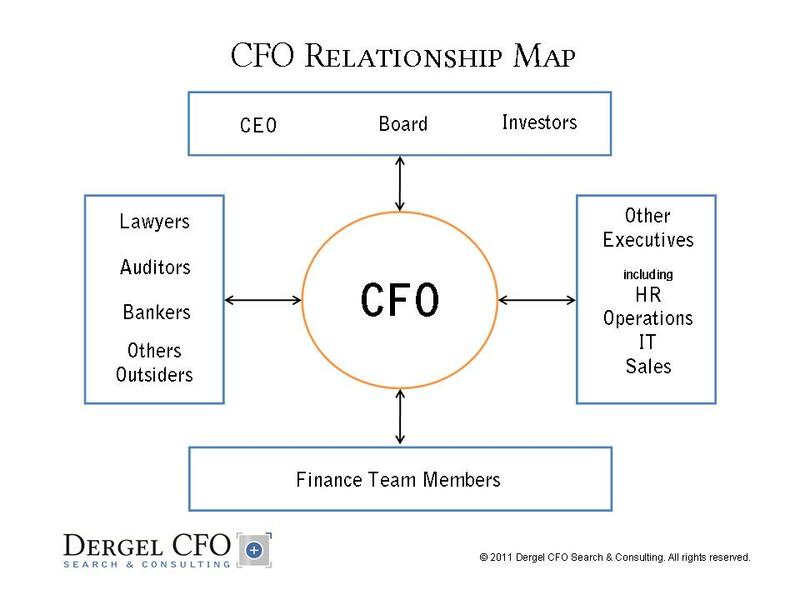 This map is a key tool we use when working with CFOs, helping them identify the relationships they have and working to develop a personalized plan for our CFO client to get the best out of these relationships. This Map is also the tool we use to identify topics for discussion that are relevant to our CFO audience. You will notice that many of the themes discussed in my blogs are based on the relationships identified on this map. If you want to improve your relationships, look at this map, identify which relationships work well, which don’t, and develop your own plan of action to improve your relationships. Go ahead, use this tool and start yourself on the road to becoming a (more) Successful CFO. In my conversations with CFOs, “so much to do and so little time” is a constant issue that they bring up as well. A CFO has a lot to do and not enough time to do it in. The recommendations of better scheduling, better IT and better staffing will certainly help the CFO accomplish more in less time. For a CFO to be most effective, he or she needs to know what their vision for themselves and their team is within the company, and what their game plan is to ensure that they meet that vision. In my experience, many CFOs are focused on the deliverables and are not taking the time to properly plan. In a world where the only thing that is constant is change, we can still sometimes be surprised how things turn out. Today is the beginning of a new adventure for me. Yet in many ways, today starts more of the same. Over the last years I have identified that I have a passion for working with CFOs and I started writing and speaking about my favourite people. In starting Dergel CFO Search & Consulting, I get to focus on what gets my juices going. What I have learned over the past years is that the model that most companies use for hiring their CFO is, at best, weak. Many companies treat the hiring of this critical role as if the role of the CFO is not important. They are not willing to invest time and money into a process that seriously evaluates their real needs, a process that involves a proper and planned search which identifies and attracts the best people possible, and a process that ensures that the new CFO can be properly integrated into the company culture and that the expectations from the CFO are properly aligned with the CEO, Board and other stakeholders. I’m going to perform CFO Search the way it is meant to be performed. Now I’m not going to change the world this way, but I will have a direct impact on my clients and their new CFOs. I will certainly be proud of the work that pays me. I do realize that the impact will be limited, especially compared to the next thing I’m going to do. I’m going to be talk, blog, tweet, present and discuss with whoever will listen about how CFO Search needs to change. How it needs to change so that companies and ALL its stakeholders can ensure that they get the best value from hiring a new CFO. Value is much more than just the dollar cost of a search. It costs the company in visible and invisible ways when they hire a CFO without a proper search. I know I will make a bigger impact here – an impact that will have tremendous reach and scope – much more than the numbers of CFO Searches I will be working on. As committed as I am to ensuring that CFOs get hired in the best manner possible, I am committed as well to the ongoing success of the CFO. All CFOs, whether newly hired or veterans in a company, face multiple challenges on an ongoing and daily basis. The biggest challenge CFOs face is not technical. The biggest challenge CFOs face is people. CFOs face different expectations from the multiple people they are responsible to. They are stuck between a rock and a rock and a rock. They have to keep the CEO, the Board and the shareholders happy. CFOs must keep creditors happy and the auditors satisfied. He or she works with and supports the other executives in the company. The CFO needs a well oiled and functioning finance team that supports him or her with correct and timely information. The talent on their team needs to be properly managed – from hiring, retaining and training, as well as planning for leadership succession in the finance group. Again, as in CFO Search I will be doing 2 things to helps CFOs be the best in their roles. I will be working directly with CFOs to help them face these people challenges. I’m looking forward to the direct impact and close relationships I will have with my CFO clients, and adding multiples of value for these CFOs and their companies. Beginning today, I will be providing opportunities for CFOs to become engaged about the people challenges they face, and providing different forums that will allow CFOs to discuss these issues amongst themselves & help them learn from each other. The forums will be using different methods, from online to in person. My involvement in this area will be to engage and facilitate discussions that make a difference to a group I feel connected to and passionate about. 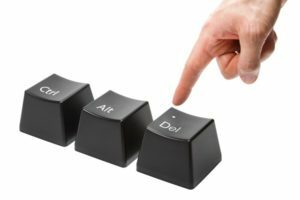 If I still have your attention, and what I have discussed here resonates with you, I urge you to reach out to me and let me know your thoughts (comment here or email me blog at dergelcfo dot com). I am embarking on a new adventure that I intend to have a positive and significant impact for companies and CFOs. If you are passionate about what I will be discussing, your engagement will make a big difference. I urge you not to sit on the sidelines and watch, but participate to help shift the importance of CFO Search & Consulting to the level it needs to be at. Help me help you.